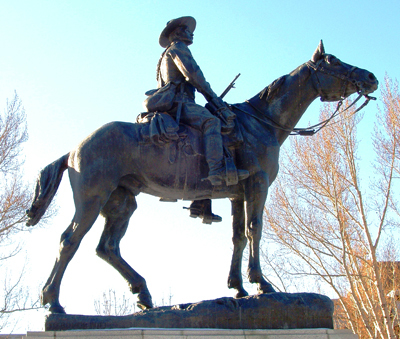 "The Horseman of the Plains" statue was commissioned as a memorial for those Canadians who fought and died in the Second Boer War. The Boer War was a defining event in Canadian history as it was the young Country's first military involvement overseas. For the first time, Canadian forces fought alongside the British Army against Dutch settlers in South Africa. About the ArtistLouis Phillipe Hebert was one of Canada's earliest world class artists. Born into a large farming family in rural Quebec, Hebert left home at an early age to join the Canadian detachment of the Zouaves (the army of the Pope). During his year in Rome, he encounters the rich sculptural history of Europe. When he arrives home, Louis Phillipe Hebert begins sculpting and joins Quebec Sculptor Napoleon Bourassa in his studio as an apprentice. He he works for several years, working mainly on wooden religious figures for the church.